A standard cue stick is 57-58 inches long. This works well for an average sized adult. But, players under 5 feet tall should consider using a little bit shorter stick to make things a bit more comfortable. Kids especially, need to be fitted for a properly sized cue. 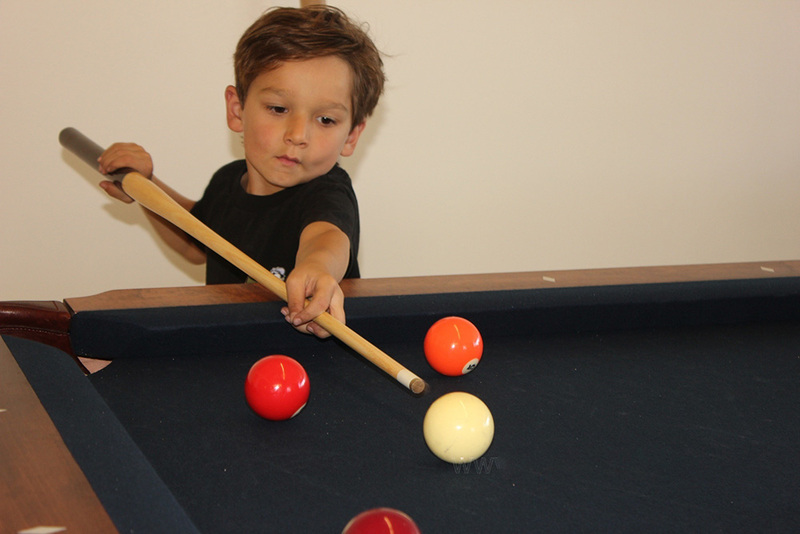 Children using a cue that is too long are more likely to jab at the ball. This forces miscues and may damage your cloth resulting in costly repairs. It also makes them less confident when making a shot. It is difficult for inexperienced youngsters to control a long stick. Our five old son pictured above, recently began learning to play. He is tall enough to see the entire table and old enough to understand the rules (mostly). He is 43″ and his cue is 42″. He has more than a few inches to grow before he’ll be able to size up to a 48″ cue. He is still very inexperienced, but is able to hit the cue ball in the direction that he wants because his stick is small enough for him to handle. 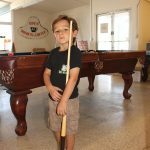 We offer an assortment of cue lengths from 36″ to 58″ and encourage you and your family to try them out in our billiard showroom to find the right size. I’m interested in a pool stick for my grandson. He is 4 ft tall and 7 years old. I’d probably go with a 48″ cue for him. Make sure that it is weighted. Some inexpensive short cues are too light. This will not give an inexperienced player the necessary control.